Molecular dynamics play a significant role in how molecules perform their function. 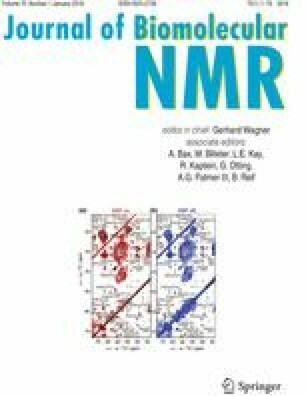 A critical method that provides information on dynamics, at the atomic level, is NMR-based relaxation dispersion (RD) experiments. RD experiments have been utilized for understanding multiple biological processes occurring at micro-to-millisecond time, such as enzyme catalysis, molecular recognition, ligand binding and protein folding. Here, we applied the recently developed high-power RD concept to the Carr–Purcell–Meiboom–Gill sequence (extreme CPMG; E-CPMG) for the simultaneous detection of fast and slow dynamics. Using a fast folding protein, gpW, we have shown that previously inaccessible kinetics can be accessed with the improved precision and efficiency of the measurement by using this experiment. The online version of this article ( https://doi.org/10.1007/s10858-017-0155-0) contains supplementary material, which is available to authorized users. This work was supported by the James Graham Brown Foundation, the National Center for Research Resources CoBRE 1P30GM106396, the Max Planck Society, and the EU (ERC Grant Agreement Number 233227 to C.G.). We thank Maria Paulat and Melanie Wegstroth for technical help in gpW sample preparation.